Don’t wear a belt or a lot of jewelry. We all know by now that we need to remove any metal, so why even have it on when you get in the security line. Your belt or jewelry can easily be put in you carry on and you will save time by not having to remove it quickly right in front of everybody behind you waiting to go through the metal detector. You are going to be asked to remove items from your pockets anyway so again why not just put them in a carry on bag. The only items needed to get through security are your ID and Boarding Pass so everything else just should just be put in your carry on. Removing you shoes has become the norm, so why would you where shoes that are not easy to get on or off. Anything with laces that need to be tied or boots that are hard to remove don’t make sense going through security and are more then likely uncomfortable on a flight. Now days jackets also need to be removed, so way not put this in you carry on before getting in line. Laptops have been needed to be removed for many years, so if you are carrying a laptop it would be best to have it accessible and easily removed to allow you to quickly put in in a tray. 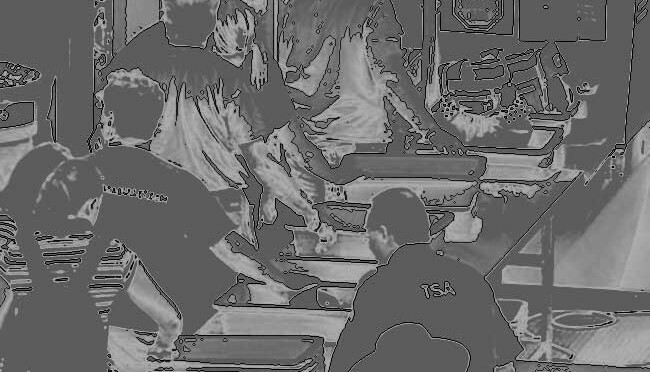 Bottom line is the TSA are just trying to do there jobs, but complaining or causing a seen is more likely to get the TSA officers to notice you and feel you may need to be screened then get you through security faster. Use your manners and respect the TSA and more then likely getting through security will be easier. With the advice above having a sensible carry on is very important. Having easily accessible pockets to put your cellphone or wallet makes removing items from your pockets not such a big deal. It also should be big enough to fit a laptop or other items that may need to be removed easily accessible. Making sure you have a good carry on is important to make getting through security an easy experience for you.